Last week I gave a talk about what I call the Learning Black Market at a Guardian seminar on the uses of Social Media for learning and teaching in higher education. It’s something that I have seen emerging from the data we are collecting for the Visitors and Residents project and from interviewing students for our study on the use of Open Educational Resources. In simple terms students personal use of the internet is generally very effective for their education but they are nervous that their practices are not valid and don’t reveal them to their tutors. The messages or lack of messages from educational institutions on these practices is generating a learning black market which masks the sheer scale of these new modes of engagement. The Visitors and Residents project is capturing student’s motivations to engage with the web for learning in as broad a manner as possible. To guide our understanding of the interviews with students in the UK and the US we have added a vertical axis (see below) to the Visitor and Resident continuum. 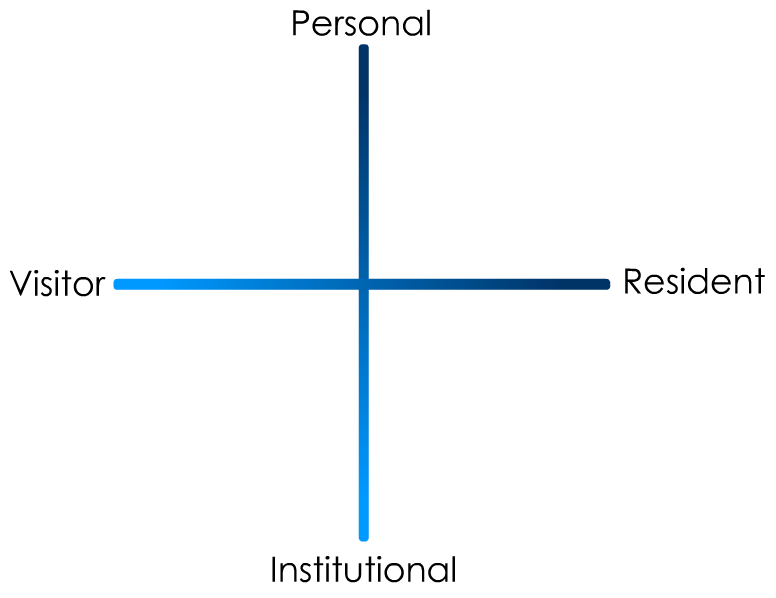 The Personal/Institutional axis allows us to plot student’s online learning activity and accepts that this activity is not bounded by resources and opportunities provided directly by the institution they are studying at. As the project progresses we hope to plot students trajectory through this digital landscape. It should also be possible to use this map as a tool to reflect on institutional approaches to digital literacy. Many of the students we have interviewed wait until the night before coursework is due then IM their friends in Facebook to confirm what they have been asked to do and to check they are taking the right approach. If they can’t find their friends in Facebook they text them to either ask for clarification or to encourage them to log-in to Facebook. There is an expectation that someone from their class will be in Facebook when they need them which is one of the reasons that coursework can be left to the last minute. I suspect that Facebook IM is used extensively for homework as it’s convenient and immediate. It’s also private and a very low risk way of collaborating with a fellow student. 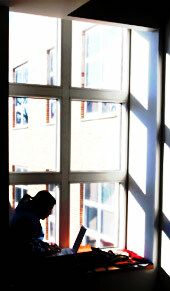 The extent to which coursework is actually completed via this method rather than just clarified is difficult to assess. There is a lack of understanding amongst students as to what constitutes plagiarism in this scenario and a consequential wariness around discussing this type of practice. The line between collaboration and plagiarism is not easy to define and I believe students would benefit from this area being openly discussed. This practice is also an interesting reminder that much of the activity in Social Media is not visible. Wall postings and twitter streams only represent a portion of the activity in these spaces meaning that platforms such as Facebook are effective at facilitating Visitor style approaches. The majority of students activity is information seeking, this could be via another person but is usually a more direct engagement with ‘content’. What appears to be a common practice (we are still in the process of analysing our data) is this very simple process. A search on Google to help complete an assignment commonly returns a Wikipedia article. As we know Wikipedia articles are pitched at an ideal level and length to get a handle on a new subject which is something our Transitional students have to do a lot. The problem is that most of the students in the Transitional education stage we have spoken to in the US and the UK have been told not to use Wikipedia and so keep this practice a secret. A simple way to do this without losing the value of the platform is to cite the references attached to the Wikipedia article rather than the article itself. This appears to be a very successful strategy for coursework but can be done without any substantive learning taking place. The tutor then goes on to say that the process of learning is about collating and critiquing multiple sources not simply taking in a correct answer i.e. the path you take in forming a new understanding is as important as the resultant knowledge. The very valid ‘show your workings’ standpoint. This is fundamental to the debate around technology and learning and the real issue at stake. Describing the web or Wikipedia as ‘inaccurate’ or negating the use of sources that have been written by multiple ‘non-expert’ authors has little impact on the actual practice of students (or the success of those practices). The debate should be around how we evolve educational processes to take advantage of or to account for these new forms. We cannot continue to teach the literacies that have been the mainstay of the educational system in their current form because the web smashes traditional paths to understanding. There are good examples of the ways in which the web can be used to facilitate learning, new approaches which accept the situation has fundamentally changed and that learning is now less likely to be the result of successful information seeking. Many of these methods involve a more Resident approach to negotiating understanding and use classic scholarly notions of discourse to encourage learning over and above the now largely redundant retention of knowledge. Unfortunately it appears that many practitioners are turning a blind eye to these issues and are stigmatising emerging learning practices by simply banning talk of platforms such as Wikipedia. Whatever the case it is clear that students need guidance on how to engage with the web for their learning and would greatly benefit from clearer messages around what it means to learn in the twenty-first century and how their practices may or may not intersect with the formal educational frameworks they find themselves in. This entry was posted by David White (@daveowhite) on Friday, September 30th, 2011 at 2:03 pm	and is filed under Open Educational Resources, research, society online, teaching and learning, Visitors and Residents. You can follow any responses to this entry through the RSS 2.0 feed. Both comments and pings are currently closed. After two weeks of being a PGCE student myself I can fully appreciate the sentiments here. Our tutors have told us not to use Wikipedia as a source. It is the first place we have all looked for information on any topic from educational theorists and psychologists to science projects. It gives a brilliant overview that signposts the main ideas involved and gives you jumping off spots for further research. We are expected to read from journals but google scholar was put in the same category as Wikipedia (not scholarly) as a search engine an dht bibliographic database searching training is weeks away. However , I find myself wondering what sort of valid assessment could rely mainly on sources such as Wikipedia. You quoted a tutor saying “process of learning is about collating and critiquing multiple sources not simply taking in a correct answer i.e. the path you take in forming a new understanding is as important as the resultant knowledge. The very valid ‘show your workings’ standpoint.” That is just one aspect of ‘assessable’ activities, namely selecting, evaluating and synthesising (literature) sources and one that is done particularly badly on many new media publications IMHO. That is why it is so dangerous to separate that from of learning activity from context. When we ground our assessment activities in a specific context (e.g. by writing our own case studies not reusing those of others that are publicly available) we can safely welcome students use of Wikipedia (selectively of course) and other sources. Wikipedia has made access to summaries of knowledge undoubtedly easier than ever before. And a textbook is a summary of knowledge too. If students are not being given tasks which require them to go beyond knowledge summaries, or if they don’t value this process then we do indeed have a problem in higher education. The process of comparing text to Wikipedia seems another good way to engage more deeply with learning. But if skim reading a textbook or Wikipedia is enough preparation for a tutorial that is a little surprising. Medicine has continually been criticised for being over-burdened with facts. Wikipedia is a great source of facts. But hopefully we are moving on to asking students to engage with more authentic learning tasks. Definitely something worth investigating, but I think you’ve picked totally the wrong label. 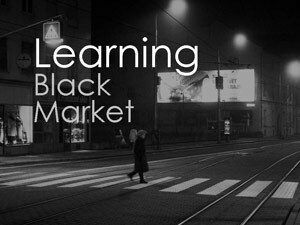 “Learning black market” is very catchy (part of the reason you picked it no doubt). Less catchy, but what you are talking about is the hidden and underground role of online networks in learning. One of the key words here is ‘market’ – essay writing services, subscription based sites full of tutorials, possibly even gradeguru.com (with its various in built reward systems) – all fit the term of the Learning Black Market than the free services and networking forms discussed here. ps In my 1st year computing systems class I not only allowed the use of wikipedia, but I made extensive use of wikipedia and wikimedia commons (and other CC sources) to develop my materials in the first place. A couple of queries – you mention Facebook et al “are effective at facilitating Visitor style approaches”. Facebook (and the like) users are much more likely, as I understand it, to be towards the ‘resident’ end of your scale. 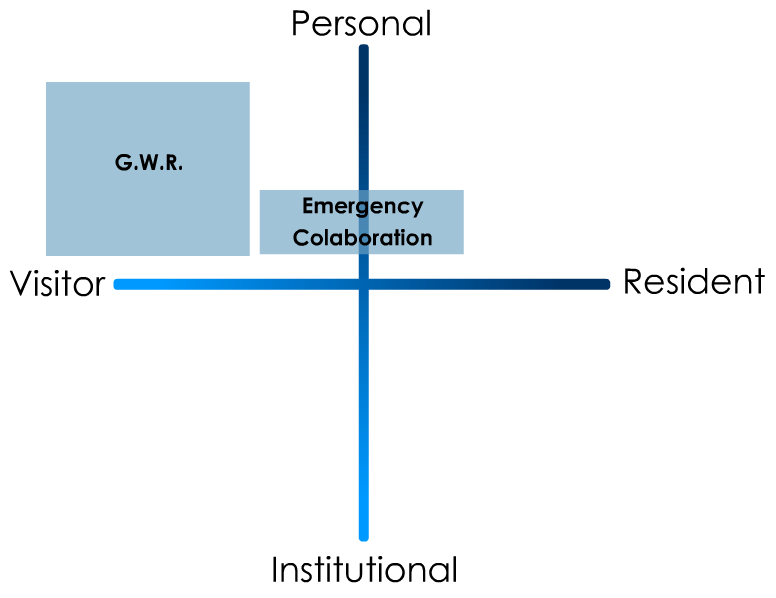 The ability to get in touch with others because they are likely to be online merely emphasises the fact that this is a Resident mode of operation. Visitors, particularly visitors in a community of visitors, do not get the convenience of having others ‘at hand’ to answer in a short time-frame. Further, visitors in a community which includes residents are in danger of being seen as too ‘self-oriented’, treating the rest of the community as resources. “Whatever the case it is clear that students need guidance on how to engage with the web for their learning and would greatly benefit from clearer messages around what it means to learn in the twenty-first century and how their practices may or may not intersect with the formal educational frameworks they find themselves in.” Actually, I would say that is far from clear. What you are describing here shows that they have adequate learning methods to allow them to jump through the institutional hoops with the minimum of effort – almost exactly what will be required of the vast majority of them in the workplace. What *is* necessary is for the interaction with formal education frameworks to be clearly examined and evaluated – whether this is to explain how to adapt useful, working, behaviours to fit with it, or to bring it up to date with the 21st Century is a moot point. What the student probably need most is to be given activities where they can learn from the experience of getting work done early, in a timely and well organised way, and seeing that this leads them to better results (in terms of learning and the results of arbitrary marking schemes). Most of the results I’ve had from interviewing and surveying students over the last 5 years bear out the fact that there is a ‘black market’ though. And I have to agree that students do not tend to reveal their tips’n’tricks to people they perceive as ‘institutional’. @Frances and Anne: Of course I agree that we should encourage students to think and to dig deeper. What worried me was the implication that the web was at fault for students lack of thought by making things too easy. In the case I mention I believe the tutor should redesign his approach not simply ban Wikipedia on the basis of convenience. As I mentioned, students in this early Transitional stage are very reluctant to discuss this kind of knowledge bartering, or it could be the case that they haven’t formed strong networks yet and tend to work one-to-one. I’m hoping that as the project develops and we interview students in later educational stages we will start to gain a clearer picture of the ‘market’ aspect of learning out on the web. I imagine that as students move through their higher education and beyond they grow their learning networks and as they gain confidence in the validity of their personal learning approaches they start to ‘trade’ in more visible, more Resident ways. @Pat Thanks, that’s a really useful way of framing the ‘problem’ and how we should respond. I especially like the point that formal education frameworks need to be reassessed i.e. it’s not the students fault Wikipedia is easy to use. This is a really thought-provoking post, which has struck a chord with me and, I suspect, many others. A few years ago, I used to run a workshop activity with educators in which each person was required to specify an area of expertise, and then to evaluate the quality of material in Wikipedia on their subject. With some groups, I have turned this activity it into a simple challenge: ‘Find Something Wrong’. Either way, I find this task makes people really uncomfortable, which is no bad thing if you can use it to your advantage and perhaps bring them to a happier place by the end. The reason it is uncomfortable is of course that it is pretty hard, which I think the learning tech community knows quite well, but others appear to be in denial about still. As Dave says, the view that ‘it must be inaccurate, because anybody can edit it..’ is still widespread. This view needs to be challenged and re-challenged at every turn. For me, one of Frances’s comment is very helpful in this context: ‘The path you take in forming a new understanding is as important as the resultant knowledge’. Absolutely! It follows that a skilled and honest academic will be comfortable with the notion of showing the students how they got to where they did in their understanding. If this includes reading, or perhaps even editing, Wikipedia – then why not? Later I met one of these students again and he told me about how he thought he had sabotaged an information literacy exercise by editing a Wikipedia article to make it better. @Anne That story of ‘sabotage’ is a great example of how formal education approaches have not yet shifted to take account of the web. The way in which a student improving the quality of our collective knowledge became an act of pedagogical sabotage is telling. @Paul I think that culturally we are still in love with the notion of the ‘expert’ which is why Wikipedia makes people nervous. Perhaps all courses should start with a critique of relevant Wikipedia pages? Better still, as Anne mentions any errors or weaknesses in the entries could be corrected as part of the process. I’ve always found it hypocritical that lecturers ban Wikipedia, then turn around and provide handouts of all the reading they need in photocopied articles!